You are the judge. Your rating? Just opened officially this last weekend in the location of the former Kiwi Cafe. Finally some real Turkish food on Lamma, run by a friendly & jovial Turkish Kurd w/good English, his Chinese girlfriend/wife and his chef friend. 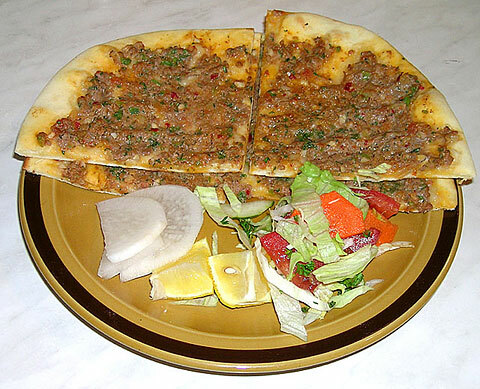 Lots of pizzas, even a tasty Turkish one (see above), fast food, even a fantastic "Lamma Burger". Everything's available for takeaway. Kebabs and pizza are great. Service is very friendly, though they can get a bit overwhelmed when it's busy. Probably just teething troubles. Highly recommended. Only complaint is that they need to provide a hotter chilli sauce! Fantastic food, it's a great place to fill up and go. Reeeeeal goooood feed! Don't tkae our word for it try it yourself! And you can order in Turkish for the authentic experience. For more info and photos, see the Lamma-zine Blog today. I don't think it's authentic at all. I ordered turkey and it wasn't even on the menu. I then asked for curds, but still no luck, so I made my excuses and left. 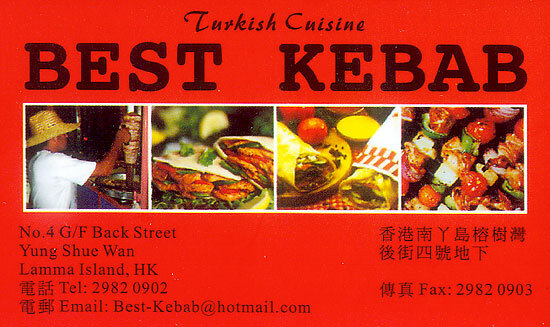 Best Kebab truly a windfall for Lamma: service with a smile from two cheerful Turks and pleasant Chinese girl, spotlessly clean stainless steel equipment and delicious bites either for sit-in eating or takeaway! Their pizzas too are a spicy novelty. Only item missing is Turkish Coffee. Wonder when they'll introduce that! Turkish coffee has been available now for a while, and it's the real deal, where the spoon will stand upright in the middle! Turkish Delight and Baklava are now available as well, plus vegetarian options. Restaurant review by the Official Court Glutton on the home page today, June 17, 2006. Is chicken, lamb and beef you buy from Halal shops? if Yes, why don't you have a stamp of "Halal" on your poster or adds? Lovely reviews guys - you have sold me. I am going to try this place. But.... at last - someone has mentioned good coffee. I am not going to go to this kebab joint for the food but to taste the coffee. Perhaps someone can correct me but I have found that Lamma lacks a good coffee house. I have tried a few places but they all seem to serve up 'arctic mud'. Oh the joys if I could find good coffee in airconditioned luxury where I can smoke, read and ruminate. New Holiday Mood - regular freshly brewed one, together with a mini-micro cheesecake. Deli Lamma - especially together with their excellent Tiramisu. I've added my "excellent" vote to the list - generally agree with others about the friendly ambience, good food and service. Party of three had a delicious Hawaiian pizza and the lamb doner kebab was much nicer than one or two I had recently in the Turkish quarter of Frankfurt, tender and tasty. Youngster had the burger and fries and was more than satisfied. This used to be an excellent place with nice people but it seems they don't even have regular kebabs anymore. The meat grills are gone and only advertise chicken kebabs, which are a long way from their choices not so long ago. 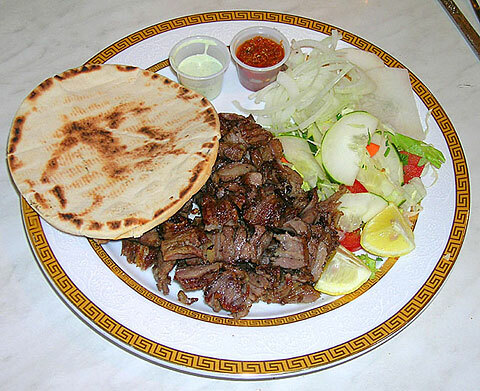 It really was the grilled doner, kofte and other stuff which used to make this a good place for a quick bite. Perhaps it's diffuclt finding the proper kebab meat supplier, allthough the kebab places in Central, Wanchai,... don't seem to have that problem. Now they only have their pizzas and hamburgers left, which are ok but still kindof strange for a place with the "Best Kebab" name. Really hope they are going to a rough time and can get back to their former standard! two of our regular dinner places. Have a chat with very friendly Salim and Parry on the bar.